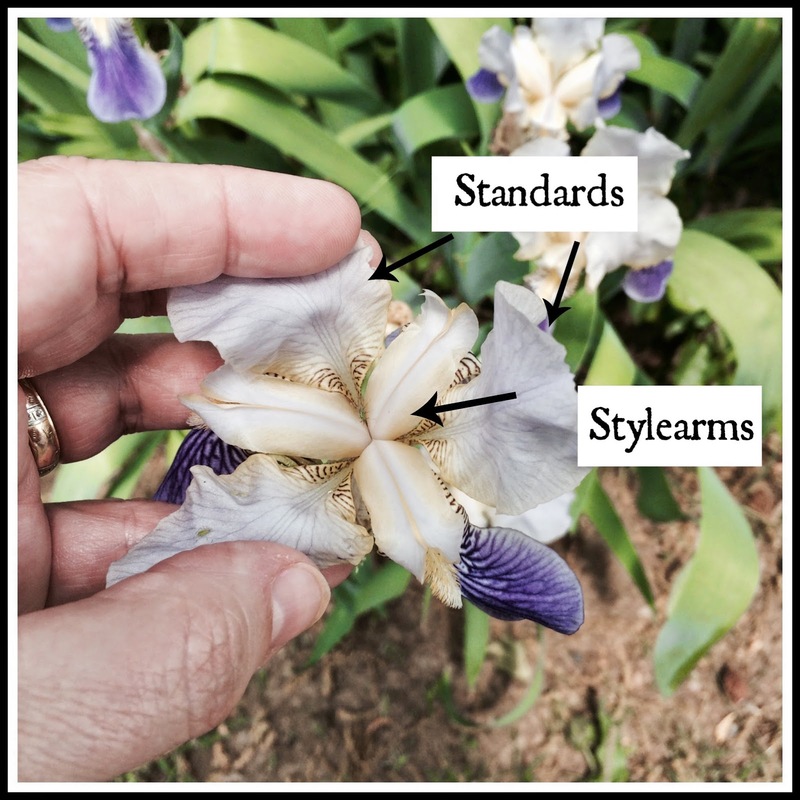 In our little Charlotte Mason co-op, my friend Sara had us look at iris flowers. I have lots of iris in my yard, and they are lovely, but I pretty much take them for granted. I wouldn't say they are a favorite flower, although my dad used to have several different kinds in his garden and it was interesting to see how many different varieties there are. I had no idea. 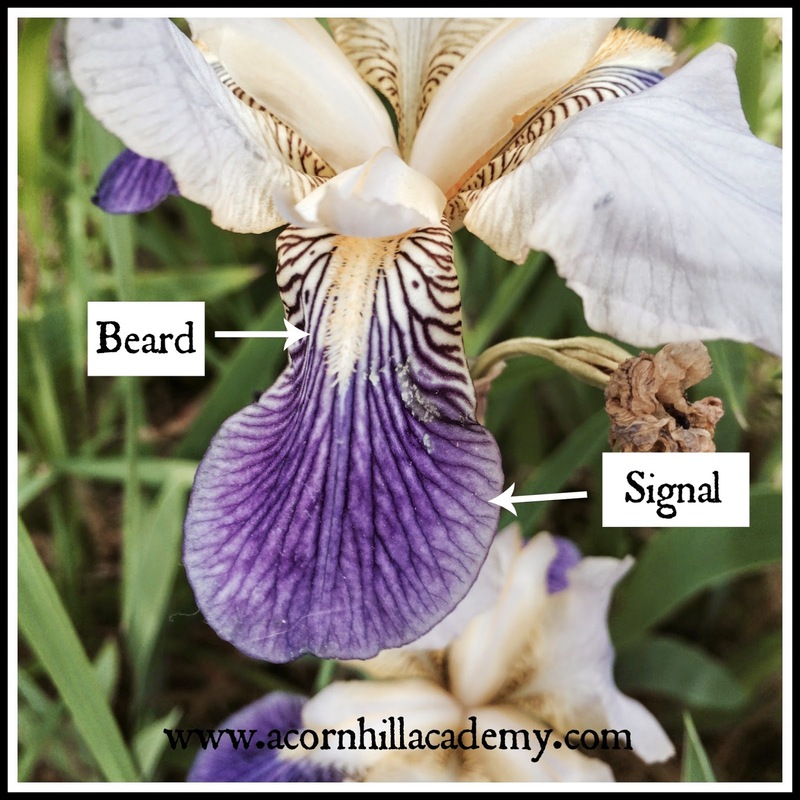 Some iris have a signal, which is a spot of different color just below the beard on the falls. Then we looked inside the flowers. I feel as though I should remember more from learning about the parts of flowers in junior high, but it seemed as though most of this was brand new information to me, too. I had heard most of the terms, but couldn't have told you what parts of the flower they named. In the picture a the right, you can see the stylearms, which are stiff segments in the middle of the flower, shielding the base of the falls, and which hold the stigma. 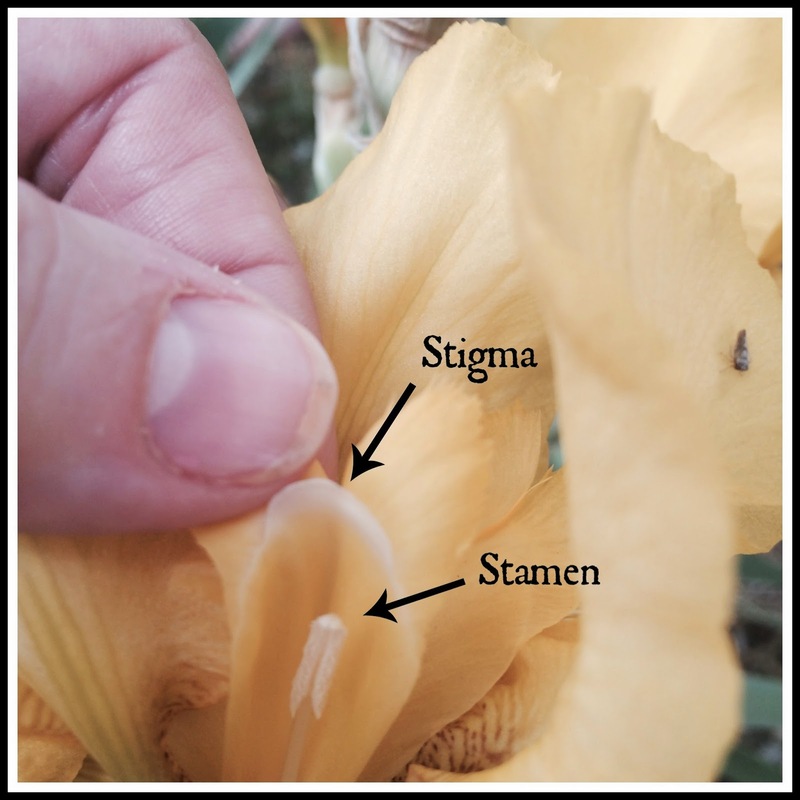 In this picture, you see the stigma, which is the flower's reproductive organ, and the stamen, or male reproductive part, which produces pollen. 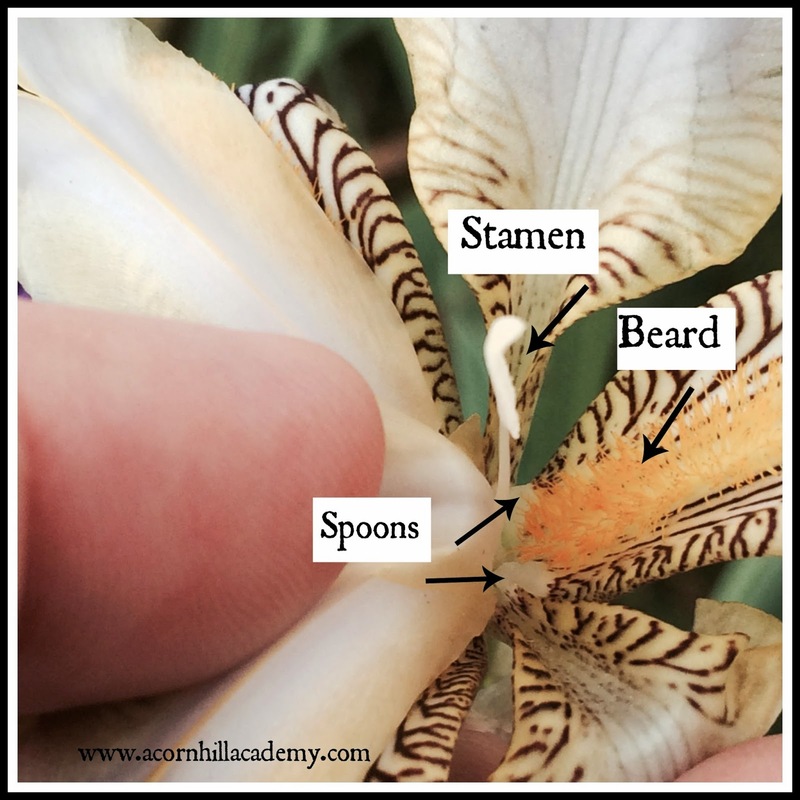 Here, you can see the spoons, defined as "small horn-like growths with small petaloids protruding from beards." And finally, in this picture, you can see the spathe, the papery-looking cover over the base of the flower, which is also the ovary; and a branch, which is a lateral extension of the main bloom stem that produces more flowers. See the iris bloom that's all curled up a dried out there on the left? I had no idea there were so many parts in one flower! Isn't that amazing? 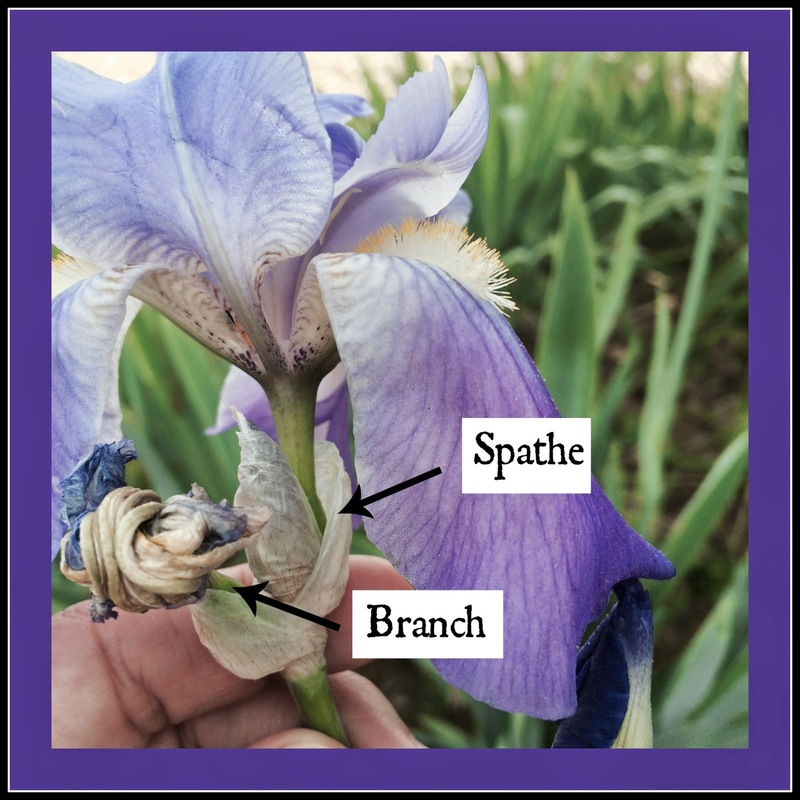 I see iris in a whole new light after getting up close and personal with some flowers. I even tried to draw one, which turned out to be harder than I thought it would be. Once I get some color in the picture, perhaps I will share that too. 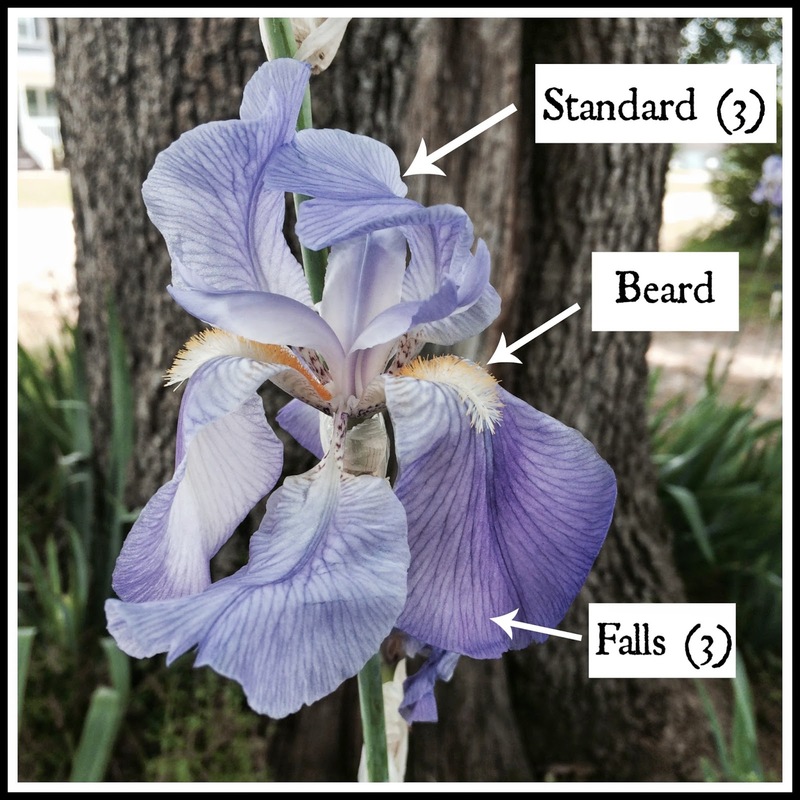 I don't usually think of garden flowers as nature study topics, for whatever reason, but I'm glad we took a look at the iris. What do you have in your flowerbeds that you could consider more closely?